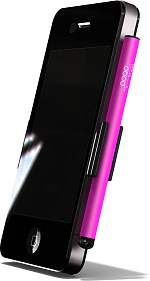 The Redesigned Apple iPhone 4 case: The Pogo Stylus! Sketch, type and navigate with greater precision. This model boasts anodized aluminum with subtle highlights, and a strict attention to detail. The included clips do a lot more than just hold your stylus. We like to think of them as super-clips. From facetime to movies, you'll love having this versatile tool always attached. Pick from our four luscious colors, or if you have an older iPhone, there are even more choices. The iPhone 4 model ships with two clips, so even if you have a case (and really, who doesn't have a case), it'll fit snugly on your phone.